What It Is : MindMaple Lite is a mind-mapping application that allows you to create detailed mindmaps. It has a version for devices running on Apple’s iOS system, as well as Windows desktop systems. 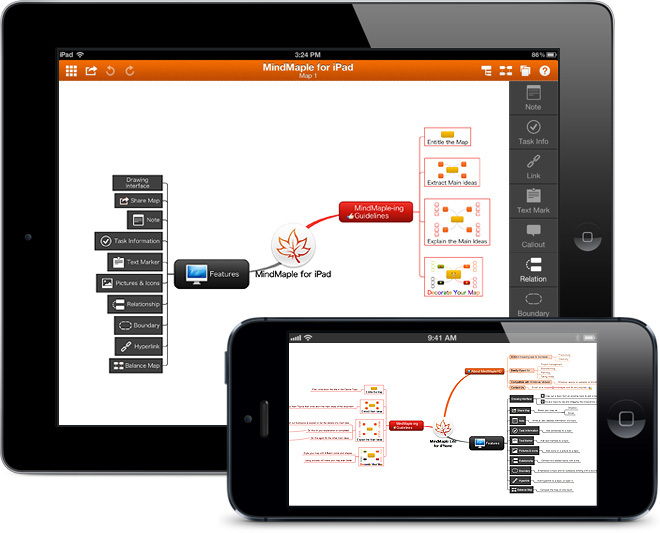 How It Works: Download the app and review the sample mindmap. You start with a central topic in the middle of your map and add branches and sub-branches off of that topic. You can shift the location/position of your branches, add notes, links and images to the map, and export to a variety of platforms, including Google Drive, email and your phone’s camera roll (as an image). Full versions for iPad and PC offer ability to export to Microsoft Office, save maps as PDFs, etc. Easy, intuitive interface – no real “training” needed to get started making maps. I love that it works across platforms – I had “test driven” other apps and disliked that I couldn’t work on a map I had started on my iPhone when I got home to my home PC. Export to Google Drive is very easy and helpful for saving your map to create an off-device archive. Saving the map as a camera roll image and emailing to myself = I could print easily and map components were clear. To save maps as PDFs, you have to purchase the paid version of the app. The paid version of the app is not yet available for iPhone. MindMaple Lite has exceeded my expectations as a mind-mapping application. I’ve become quite enamored of mind-mapping as a tool for organizing my writing assignments, as well as mapping out other complex tasks or brainstorming options that may have inter-relationships or just benefit from being displayed visually. The other key to love of this app for me is that it offers PC and iOS versions – I had a very hard time finding any other system that operated as well, produced as nice a map, and worked on my Windows 8-based PC and my iPhone 4.